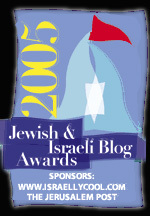 Israel's Democracy is little more than half a century old and weathering some serious challenges. 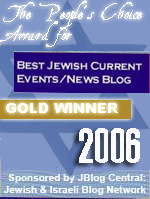 Ignored by the international and domestic press, Israel has suffered a Coup D'Etat. The government currently in power is in power illegally and is unelected. The Israeli system of government does NOT directly elect the Prime Minister, instead it elects a political party. The political party which won the election was the Likud and it was the democratic choice of the voters and it ran opposing unilateral withdrawal. The Likud is not holding office now. Instead a splinter party composed of breakaways from Labor and Likud hold power with a party called Kadima which was never elected. The pretext for its staying in power was a ruling that Sharon was only "temporarily incapacitated" rather than "permanently incapacitated." The fact of the matter however is that Sharon has suffered brain damage and remains in a coma. No one, including his doctors or family, believe he will return to office. He is permanetly incapacitated and power has been illegally vested in an unelected government. At the head of the Kadima party and acting as Prime Minister is Ehud Olmert. In 1996 Olmert was indicted on criminal charges, of entering fraudulent entries in documents, using fraud, guile and deceit, receiving goods by fraudulent means and knowingly giving a false statement. He was later acquitted. His brother Yossi Olmert fled debts stemming from his associated with organized crime to America. Olmert's wife is a supporter of Meretz and Peace-Now. The Israeli equivalent of the ACLU and Cindy Sheehan. Both of his sons refused proper army service and left Israel. His daughter is a lesbian who teaches literature. The Kadima Party was created to destroy both of Israel's leading parties which it nearly succesfully did, and turn a democracy into one man rule. That man now lies in a hospital in a coma. His successor, Ehud Olmert is desperately trying to hold on to power with elections coming up. With the Gaza Disengagement a disastrous failure that has brought Hamas to power and his hands tied by the U.S. and unable to fight terrorism, Olmert has instead decided to stake his political future on demonizing and destroying the settlers who represent the most nationalistic and committed base of the country and the army; and therefore the biggest threat to him. Olmert has begun a war against the settlers, provoking violent confrontations through expulsions and destructions of homes. For this he has sent in the Yassam, the black clad forces. These are not military or ordinary police. They are thugs selected for no other reason than their willingness to beat and maim. The behavior you see is not representative of ordinary law enforcement or soldiers. Many of these are neither Jews nor Israelis. Some are Russians and African. They are thugs sent by an illegal and illegitimate government to destroy its political opposition before the election. Further what you are seeing is much bigger than Israel. It is said of King Shaul who spared the ruler of Amalek but slaughtered the Priests of Nob, that he who is kind to the cruel will ultimately be cruel to the kind. And so we see today that terrorists and criminals in Western countries have rights but those who are religious and love their country have none. It is they who are persecuted and the terrorists and criminals who are protected by lawyers, admired by the media and like Tookie Williams, treated as role models. The Supreme Court has permitted companies to take away by force the private property of citizens to build parking lots even as we spend hundreds of billions to rebuild the homelands of our enemies in Iraq and Afghanistan. In Australia and Europe it is a crime to criticise Islam and Muslims. Soon that will also be the case in America. Freedoms are eroding and our enemies rejoyce. What is happening now in Israel is not an isolated phenomenon. It is what will happen here too. As horrible as this is, it seems to me that in these End Days before Moshiach, certain scenarios need to play themselves out. What happens here on earth (the world of action) is likewise happening in Shomayim (in the spiritual dimension). With that in mind, It is still heartbreaking to see such young people cruelly injured by thugs, as you explained. But do we really have to play into Armilus' hands? We have no real authority to guide us in this era. One by one they are being taken away from us. With an open stage, the scene is set for Moshiach. Let us each use all our wisdom and seek out a true Torah scholar to consult with in order to survive these days and witness our historical justice at the Hand of Hashem. Yes Moschiac is coming but be very careful. We've been trying to tell you for 1975 years that first will come the anti-Moschiac. He will deceive most. A horrible tribulation must pass before the True Moschiac comes. Wait for HIM. Blessed is He that comes in the name of the Lord. First of all Moshiach will be a Jew and we know all about that. You believe a messiah came already and will come again..fine go ahead. Whatever, when Moshiach Ben David comes in these end times there will be no debate as to who or what he is.. so lecturing is of no use for anyone. Secondly, your idea of the tribulation is a Jewish teaching.. not a christian one. We fully know that the time of Jacobs trouble is coming on this earth. Jews knew about the man you call anti christ long before the time of Jesus also. He is called Armilus and Jews are no stranger to who this man from rome is. You bring nothing new to the table. But when you say "I told you so" it comes across as rude and I am sure that is not your intention. Work with us, not against us. remember your nt teaches that "we Jews KNOW who we worship". Sultan, thank for this post. There's something I don't understand though. Why are the Jews of Amona and Gush Katif called "settlers"? I guess what I am really asking is why in these cases these Israeli citizens are called "settlers" in a pegorative sense, rather than as pioneers, similar to the settlers of the American west? It seems to me that calling these Israeli citizens "settlers" is being used as a euphamism for something ugly; if not outright racist, certainly a politically charged term. And no doubt is used to marginalize people. It might sound like a minor issue but it always comes to mind when I hear or read about Jewish settlers in Israel. You should be blessed and protected for your greatly informative Blog. you are giving fodder to the enemy for when they claim the israelis use force against them. now they have proof that the israelis even use excessive force against their own people. what were the girls doing on a rooftop if they were supposed to be leaving? to stop all this that has gone on in our countries is for the U.S. and Israel to find a Gideon, a Barach, a Samson, a Jepthah to rally the godly to take a stand. We have been so conditioned to let someone else do for us what we need to do that nothing gets done, whether through fear, or whatever other reasons we may have. If you/we are loosing our freedoms, its becuase you/me/we/I/us did nothing to retain them!! !